The IRS released the newly redesigned 2018 Form 1040 and associated schedules on June 29, 2018. 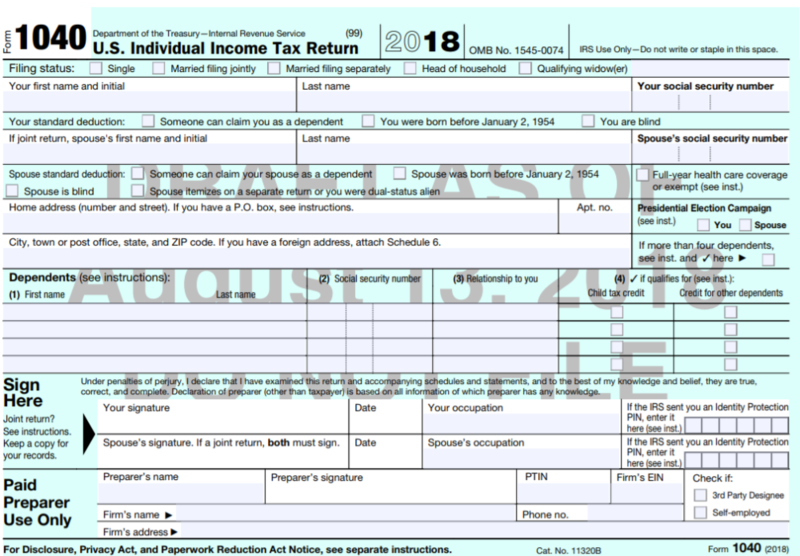 The redesigned Form 1040, about half the size of the 2017 (current) version, will also replace the Form 1040A and 1040EZ for the upcoming 2019 filing season. Includes the remaining income types such as from Schedule C, D, E and F, unemployment compensation, etc. 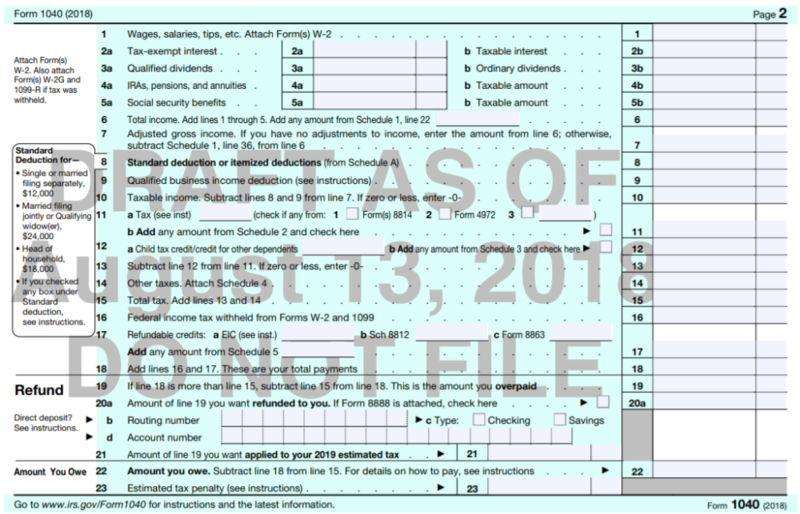 that were shown on the current Form 1040. All adjustments to income such as Educator expenses, IRA contributions, student loan interest, etc. Schedule 2: (Tax) – Includes all lines that are used to calculate total tax such as the regular tax, tax on child’s unearned income, alternative minimum tax, etc. Schedule 3: (Nonrefundable Credits) – Includes all nonrefundable credits such as credit for child and dependent care expenses, education credits, child tax credit and the new credit for other dependents, etc. Schedule 4: (Other Taxes) – Includes all other taxes such as self-employment tax, household employment tax, etc. Schedule 5: (Other Payments and Refundable Credits) – Includes the lines for other payments and refundable credits such as extension payment, credit for federal tax on fuels, etc. Schedule 6: (Foreign Address and Third Party Designee) - Where foreign address and third party designee information is shown if they are applicable. The IRS has explained that the version of the newly redesigned form released on June 29 is a pre-release draft and the IRS will be working with the tax community to finalize the Form 1040 over the summer. The final version of the form will be released towards the end of this year. Removal of exemption amount boxes and the total exemptions line. Addition of check box for the new credit for other dependents for each dependent. New line 9 for the new qualified business income deduction (20% deduction for pass-through business income – Sec 199A). For additional information on the redesign of the Form 1040 see IRS news release -– IRS Working on a New Form 1040 for 2019 Tax Season. Please be aware that forms 1040EZ & 1040A were eliminated by the Jobs and Tax Cuts Act of 2018. In addition, if you are mailing your 2018- 1040 postcard, you are required to include all 6 schedules (worksheets) in order to for the IRS to process all your credits and deductions.